Do you know why we love our clients? Well, among the many, many reasons: working with them makes us smarter. Let’s take a look at OSIT for example. The Nevada State Office of Science, Innovation and Technology (OSIT) has a mission to inform students, parents and educators about science, technology, engineering and math education (STEM) and encourage careers in those fields. In the fall of 2016, OSIT came to us with a mandate from Governor Sandoval — help build the STEM workforce Nevada needs right now and will need even more desperately tomorrow. News flash: Nevada is facing a shortage of skilled workers, especially in industries that require proficiency in science, technology, engineering and math. The tech companies are here, and if we want them to stay and tell all their friends how awesome Nevada is, we need to provide a skilled workforce. Our mission? To create a brand that would help accomplish these goals. The hardest part of that mission? You guessed it: Creating something that would be interesting to teens, parents and educators. If you’re a parent who has teens — or a teen who has parents, for that matter — we’re guessing you can understand the difficulty inherent to that challenge. We started by establishing the brand with a name, logo and tagline — Nevada STEM Hub: Information and resources to develop a vibrant Nevada STEM workforce — to clearly explain their mission and to collect and share relevant STEM info throughout the state. 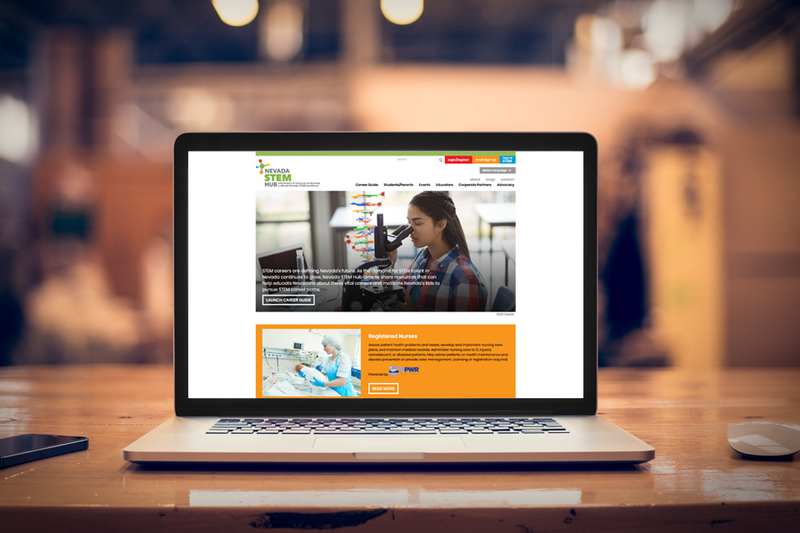 After establishing the brand, we developed the STEM Hub website, the centerpiece of our marketing efforts and a central location for STEM resources, education and career information. We created an interactive component — the Career Matchmaker — to guide users in selecting a STEM career field that takes into account their interests and skills. But that was just the beginning. In order to encourage regular use of this interactive site, we developed a content creation plan that includes ongoing research and writing of STEM blog posts. We may have said it before, but we freaking love shining a spotlight on how cool this state is. Writing stories on the innovative STEM people, businesses and activities happening throughout Nevada are the virtual cherries (so many cherries!) on top of an already rewarding job sundae. Do you know who inspects the gas pumps around the state to ensure we’re getting what we pay for? Did you even know that’s a thing? We had seen the stickers on the pumps before, but we had no idea who the wizard was behind that particular curtain. But now we know, because we got to work with Jerome Plant, a metrologist for the Nevada Department of Agriculture, on his guest post. Dang, did we give away the answer? Read the post anyhow. You’ll feel so much smarter. Some of the parents among us were encouraged to know the value of alternative paths to success — meaning that unlike what we were all told as kids, there’s a new school of thought that 4-year college degrees may not be the be-all and end-all for every kid. We learned the science behind many of our favorite Thanksgiving traditions, including how they keep those fabulous floats afloat. We got to interview Rudy Bein, a Medicolegal Death Investigator/Technician Supervisor. His job? To investigate suspicious, violent and unexplained deaths in order to identify and report on the cause and manner of the death. Yes, that is most certainly a STEM job, and one that is becoming more and more cutting edge as technology continues to evolve. We learned about cool businesses like Above GEO that manages a fleet of drones throughout the state; Breadware that helps businesses make their Internet of Things (IoT) ideas a reality; and Elemental LED, the largest manufacturer of low-voltage lighting solutions in the country. Know what all of these companies have in common? They’re all located in our beautiful state — oh, and they all have incredibly cool potential jobs for Nevadans. We got to shine a spotlight on Jason Geddes, the Washoe County School District’s (WCSD) Energy & Sustainability Manager, and everything he’s doing to not only make WCSD more environmentally friendly, but also to enlighten WCSD students about what goes into an environmental career. For the Fourth of July, we researched and shared fun projects that involved blowing stuff up. Legally, of course. Potentially the most fun? We’re currently researching stories on students and teachers making a STEM difference throughout our state. Stay tuned for those, or follow the STEMHub Facebook page for updates. We at Estipona Group are doing our small part to help the state meet the growing need for trained STEM professionals. And, provided our brains don’t explode from all the cool info we’re learning, we’re having a great time doing so! If you’re interested in some brain growth for yourself, follow the Nevada STEM Hub on Facebook. Or follow the Estipona Group on Facebook, because there you get to learn about all of our awesome clients.